Michael, driving me through the night, was probably skirting Paris when the digits of the clock turned to 00.01 today. We were aware of the metropolis as the dark midnight sky brightened with the multicoloured lights generated by urban living. A surprising number of other vehicles were on the road, most, as we continued further south, heading north towards the capital. My son had not enjoyed dubious sandwiches he had bought at Calais, so we made a number of stops in search of more sustenance. These were unfruitful, as every outlet was closed. Fortunately there were a number of all-night public conveniences, albeit of variable cleanliness. The indigo sky was largely cloudless and sprinkled with numerous stars. It was not until about six in the morning that light, then eventually a strong sun, began to emerge behind my left shoulder. Parts of the landscape seemed to be scattered with creamy white pools amid the undulating hills. Nearer to hand, swirling mists, which is what these were, rose from moist fields and drifted upwards to dissolve into the air. The low sun cast long shadows across the pink-tinted countryside. I regretted that we had ‘no time to stand and stare’ nor, more importantly perhaps, to photograph such evocative scenes. What happened on arrival must await my next post. Having borrowed yesterday’s title from one American writer, I turned to another, Jack Kerouac, for today’s. For the past ten days I have kept quiet about a stream of electronic communication between me and people in France concerning my house in Sigoules. This has been most distressing, and the silence difficult to maintain. A family I had agreed to let the house to, and had thought were friends, moved in ahead of the drawing up of a contract without letting me know. The first I knew of it was when I received complaints from neighbours about noise throughout the night. Texts and e-mails to male partner of the couple who seemed to be in possession gleaned no response. Having had very little sleep during this period, I set out on a long journey today to attempt to remove my squatters. The first step was Jackie driving me to Michael’s home in Sanderstead. There, we were greeted by Emily who scanned my passport and proof of ownership documentation and e-mailed this to a solicitor Michael had researched on the internet and engaged on my behalf. The police were aware of the situation. I would not have been able to manage all this alone. 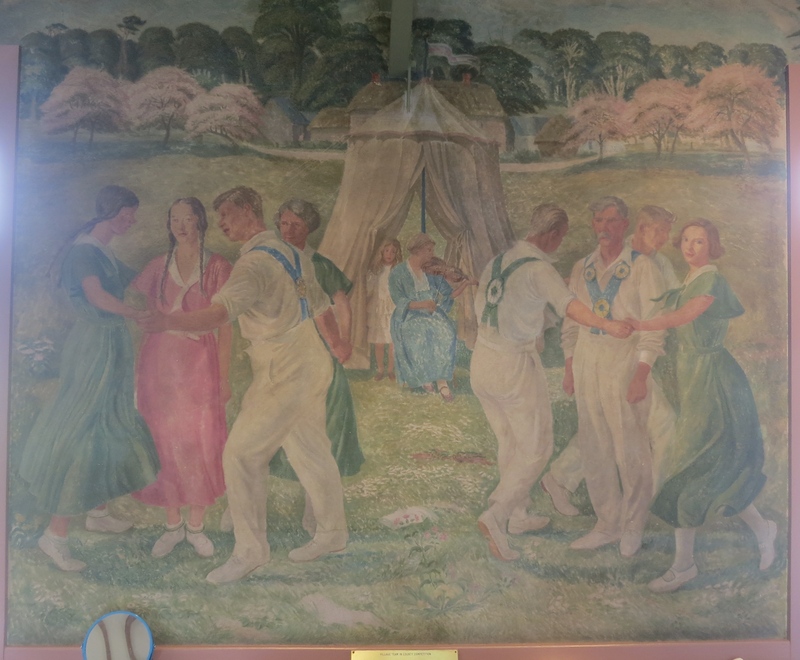 When, in the 1970s and ’80s, as a Social Services Area Manager, I had been responsible for my staff going out on potentially difficult and stressful visits, I had always insisted that they had all the necessary help to have administration, relevant forms, and potential back-up in place, so that all they had to worry about was the job in hand. I now have direct personal experience of how necessary this was. Without the support and practical help of my friends in France; my lady and my son and granddaughter at home, I would not have been able to carry this through. An hour after Michael came home from work, he drove me to Sigoules. The only respite he had from more than ten hours at the wheel was the 35 minutes on the Eurotunnel train. I am known for falling asleep as a passenger. Remarkably, however, I remained awake, except for momentarily dozing on occasions. 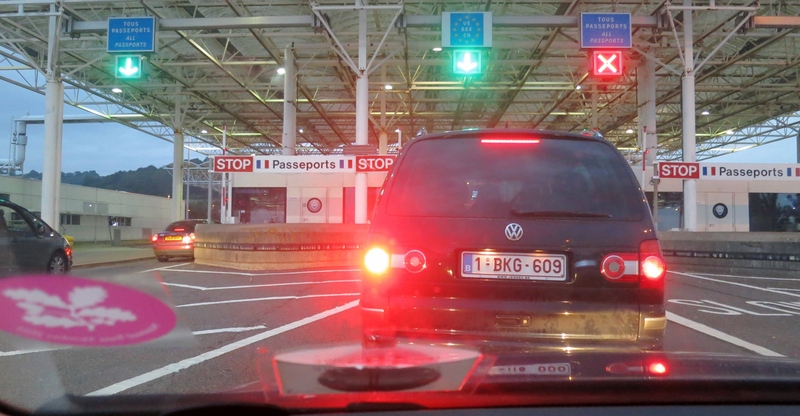 Having arrived in Calais from Folkestone, we set off into the night, taking the faster toll road route skirting Paris. Thanks are due to the American playwright Eugene O’Neill, for today’s title, taken from his acclaimed drama. 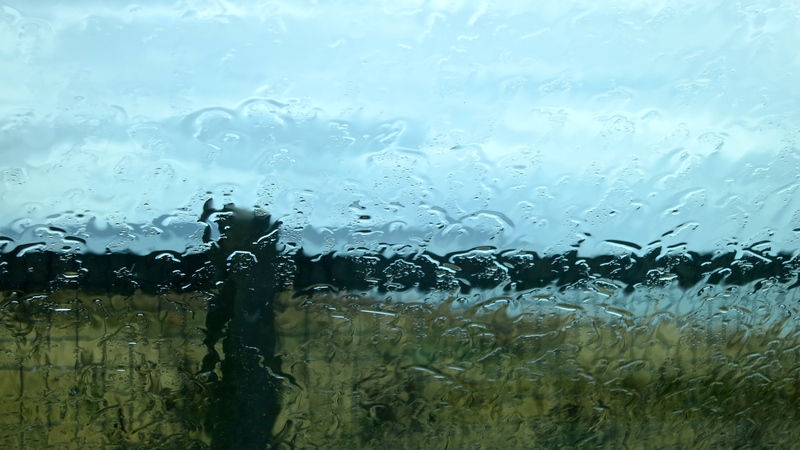 Yesterday’s steady rain changed to showery weather today. One rainfall soaked us as we ran from the car to Molly’s Den; another kept us in the car when, after the Den shopping trip Jackie and I drove down to Barton on Sea. The return visit to Molly’s was in search of some Victorian glasses for Shelly’s birthday. We found them and also the bonus of present for someone else which cannot yet be mentioned. The ‘Bronco’ toilet paper of the 1940s was made of a single layer of tissue paper, rough on one side, and shiny on the other. It wasn’t very comfortable, and if you used the wrong side you could get yourself into trouble. 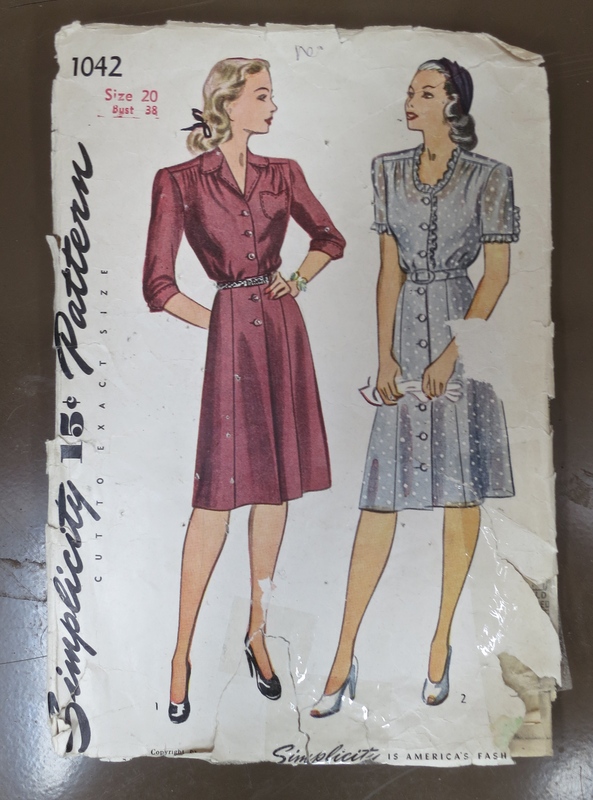 Mum’s dress patterns, being rather flimsy, were not much better, but in post-war Britain you used what you could get hold of. Again on our last trip to the cubicles (in Molly’s Den), I had found some framed pattern covers, roughly contemporary with those Mum cut up for us to use when closeted. Today’s find was even better. 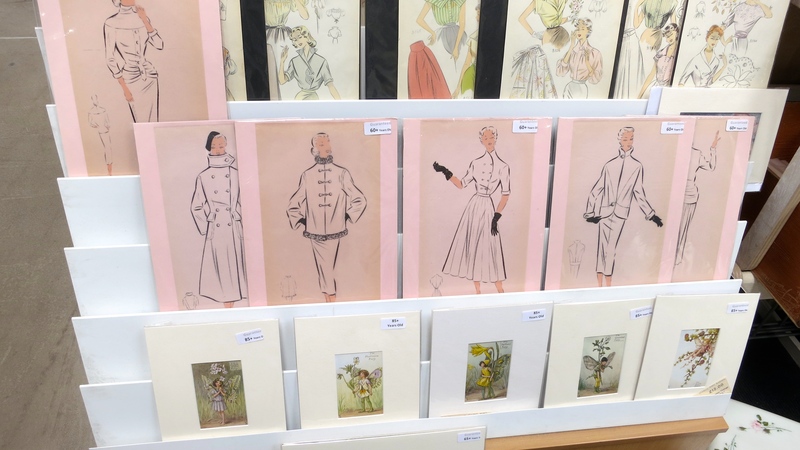 There were two actual patterns from the 1940s in their covers. I eagerly opened one of them so I could once again feast my eyes on our loo reading material from that decade. These examples were American and only printed in English so I was denied the pleasure of once more seeing the word that had creased us up when we were early learners. When I had shown Elizabeth the pattern covers, and mentioned them on the phone to Mum, each of them had the same initial response to make: ‘Schnittlinie’. Probably aided by the symbol of a pair of scissors at the edge of the line, I was quite proud, all of seven or eight years old, to be able to translate ‘cutting line’. Elizabeth, incidentally, twelve years younger than me, never had the joys of reading the word, but it was already firmly embedded in family culture. Hence her immediate association with it. As a matter of interest, on account, no doubt, of the number of visitors we had recently, Jackie first of all had shopped at Lidl for a replacement stock of toilet rolls, on which we had experienced a run. I have now taken so many photographs of the Isle of Wight, that I amuse myself by varying the weather, the light, and the viewing angle. The heavy rain on the windscreen gave me a different option today. It is in the picture, just above the bar of the car park barrier. The rain eased off enough this afternoon for us to begin to populate the flower bed cleared by Elizabeth over the last couple of days. I dug a space, which involved moving an acanthus further back, and Jackie planted half a dozen chrysanthemums she had bought in Lidl. 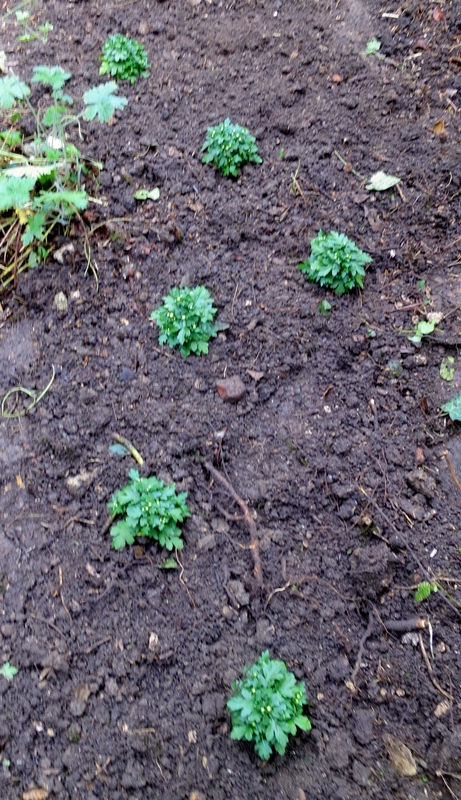 They don’t look much at the moment, but next year they should be up to two feet tall. Late this afternoon we drove over to Shelly’s birthday tea party. 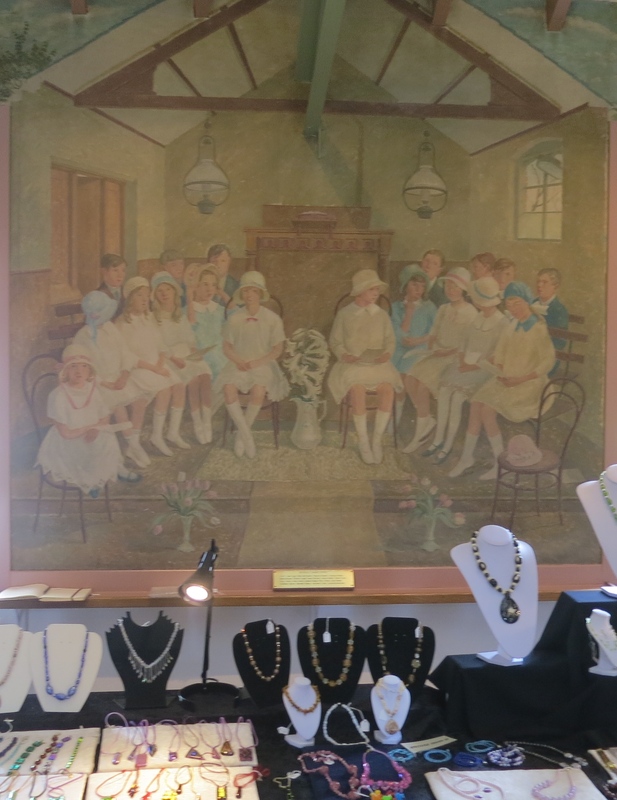 She had produced a splendid array of canapes, well-filled tasty sandwiches, pork pie, warm quiche, and homemade cakes accompanied by cups of tea and glasses of Cava. She was very pleased with our present. She had in fact told us about Molly’s Den, which added a pleasing touch to our purchase. 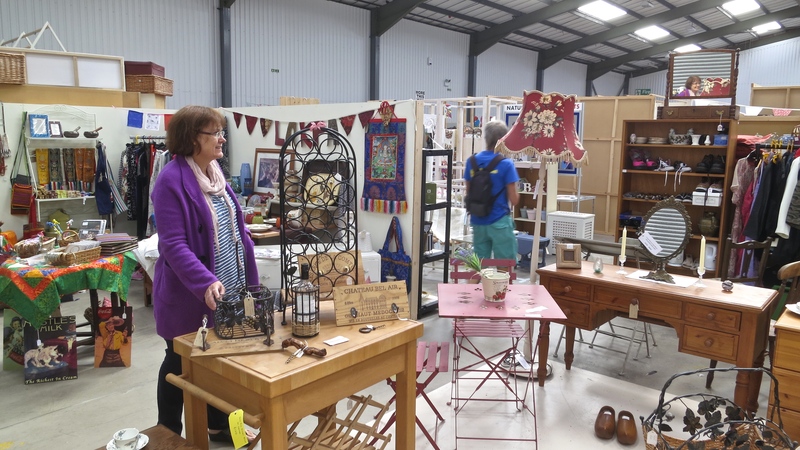 Jackie and Malcolm were there, as was Pete, and daughter Katie who is about to open her own stall at a similar outlet in Wimborne, so the conversation naturally led to stories of antiques and auctions. It was particularly nice to meet Ron and Jackie’s parents, Ray and Daphne. Today was the perfect British Bank Holiday. 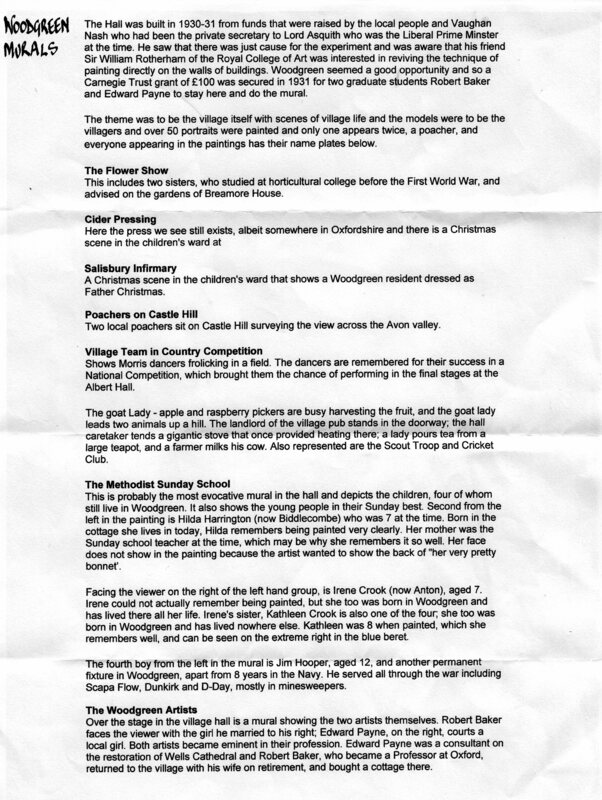 That means the temperature dropped, and incessant rain – ruining all the fetes, including the Hordle and Bisterne Scarecrow festivals that so many people worked so hard to arrange – fell throughout the day. 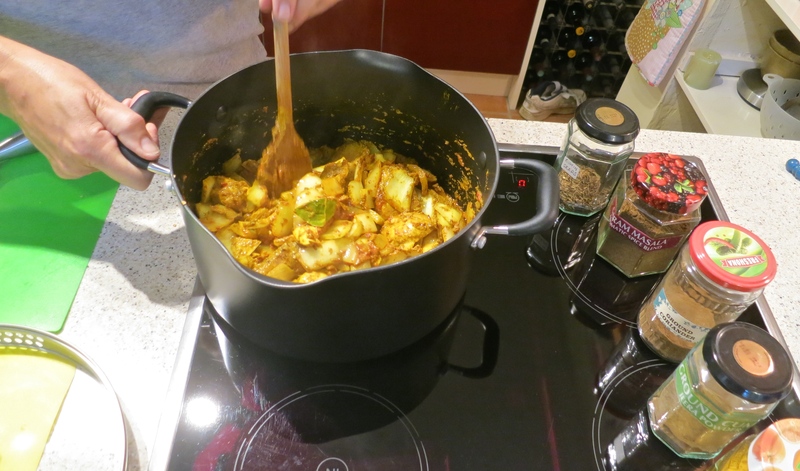 Jackie spent a great deal of time cooking a chicken jalfrezi (recipe), and otherwise pottering, whilst Elizabeth and I worked on putting together one set of photographic prints for our brother Chris, and another for The First Gallery’s Christmas exhibition. I contributed a couple of family portraits, the first from Louisa and Errol’s wedding on 5th September 2009. 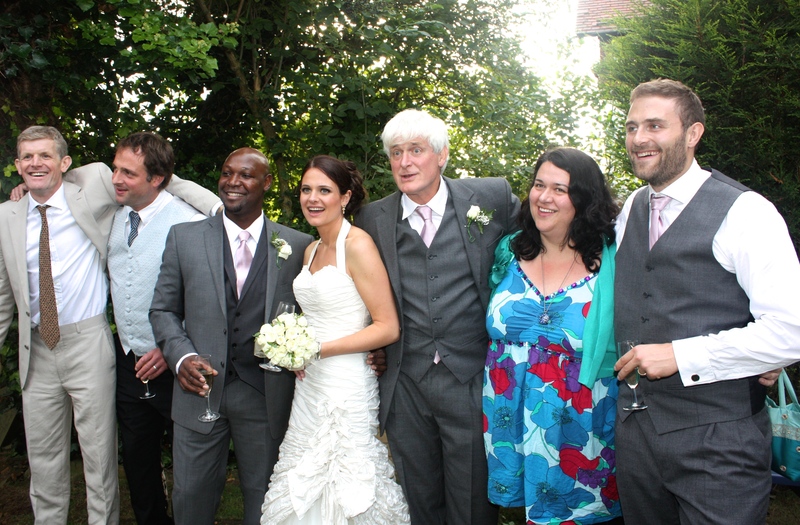 This shows, from left to right, Michael, Matthew, Errol, Louisa, Becky, and Sam. (I’m in there too.) This rather lovely shot was taken by a brother-in-law of the groom. I call it ‘The full set and Errol’. 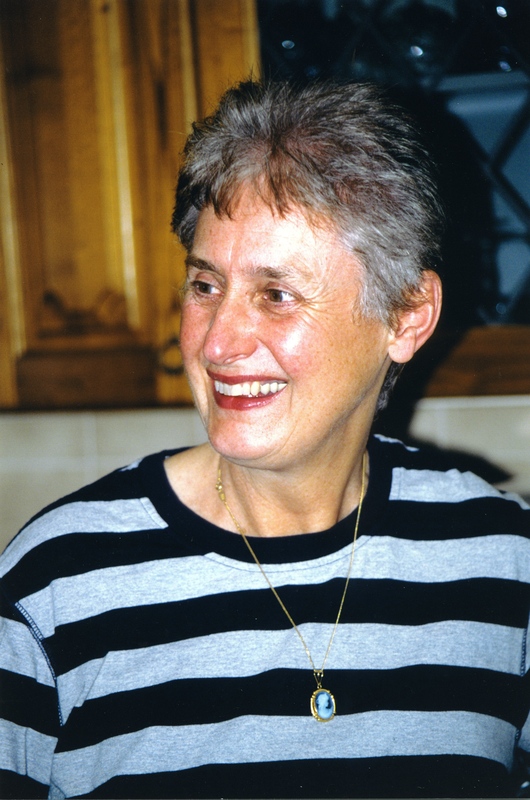 A couple of years earlier, on 14th April 2007, our sister Jacqueline celebrated her 60th birthday at her home in Boston, Linconshire. Once again a rare collection was photographed. 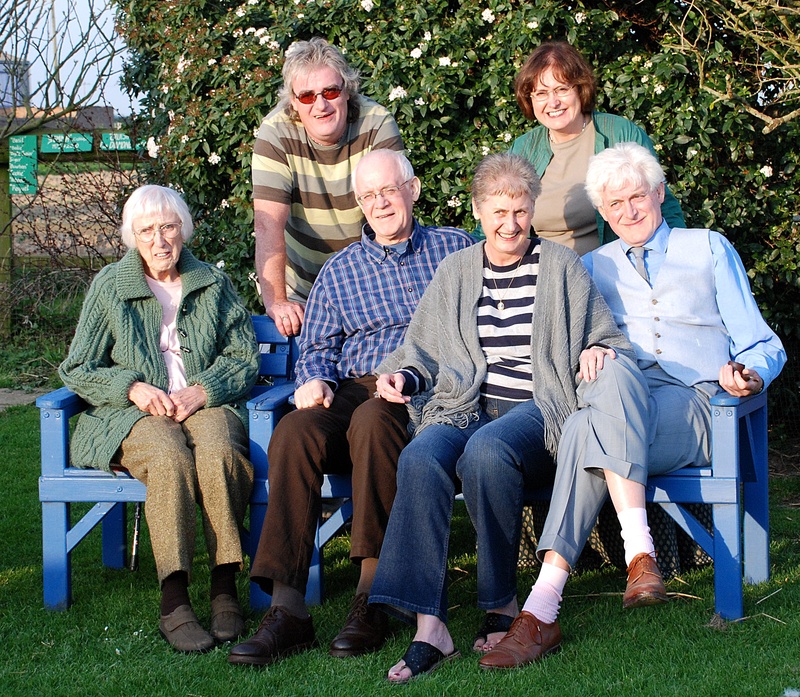 This featured Mum and all her children: Joseph and Elizabeth standing; with Chris, Jacqueline and me seated. The two standing members would probably claim this to be an example of ‘age before beauty’. 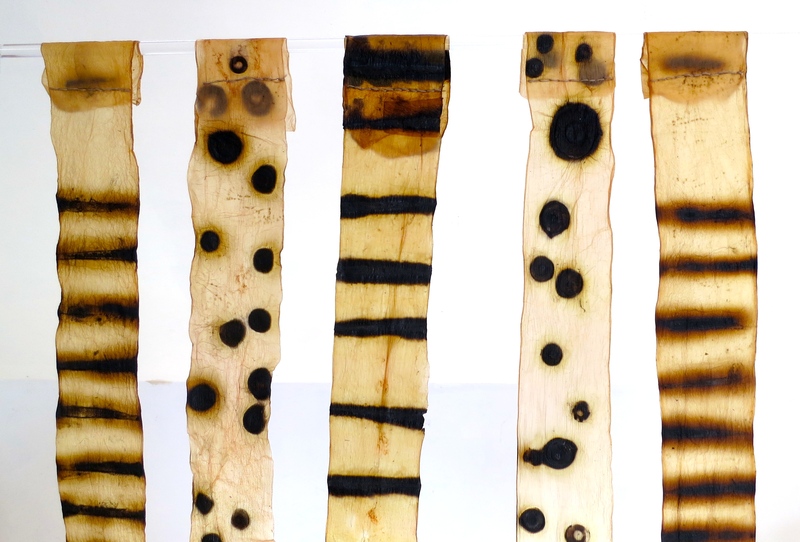 A fascinating fact is highlighted in these two photographs. I have five children, as does Mum, and in each group there are eighteen years between the youngest (Louisa and Joseph) and the oldest (Michael and me). I cannot remember who took the second picture, but I do know that the weather was better than it was today. Which is just as well because I left my umbrella in a tube train on my way from Bayswater to Boston. That party of Jacqueline’s produced two more of today’s prints, one of Michael’s wife Heidi with Chris’s wife Frances, and one of the birthday girl herself. 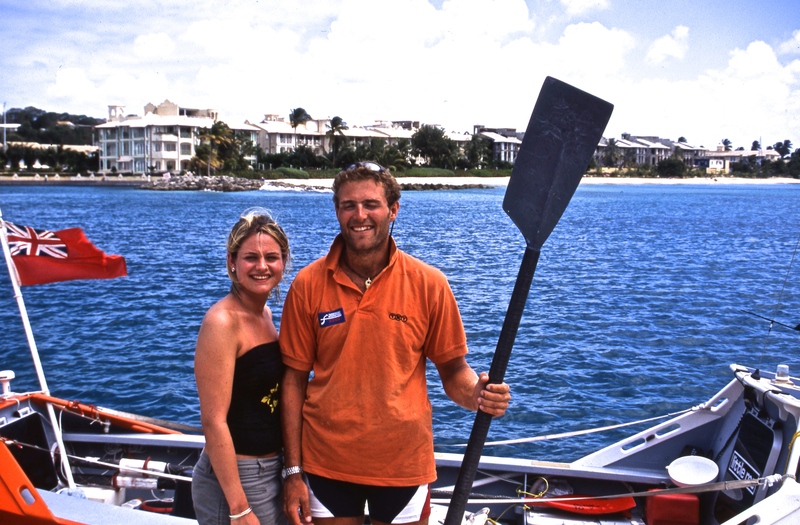 I have referred to Sam’s epic Atlantic Row on other occasions. Chris, Frances, and my niece, Fiona, were with Jessica, Louisa, and me in Barbados to see him come into Port St Charles. in May 2004. A print of brother and sister just after Sam had risen from his boat, seemed a fitting final contribution from me. Elizabeth’s two photographs featured each of her children and their respective partners. 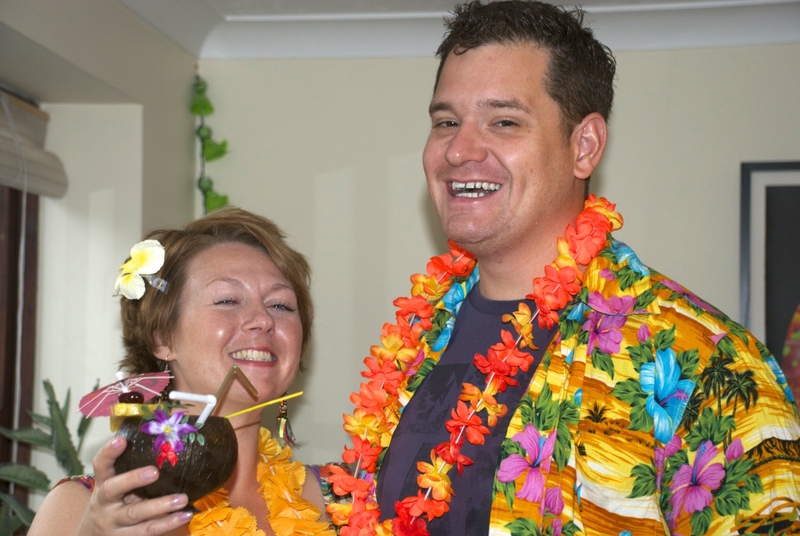 Adam and Thea celebrated my nephew’s 30th birthday on 20th August 2011, at their home in Northwood, in Hawaiian style. 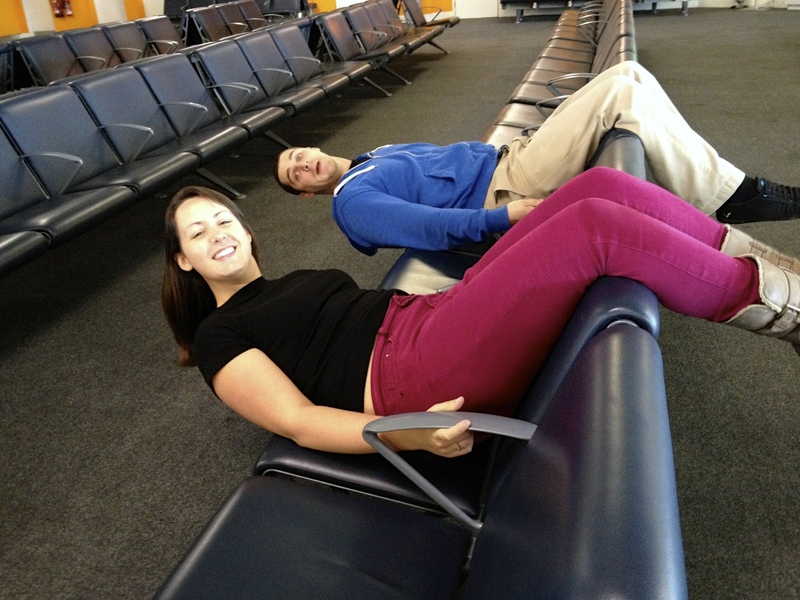 Danni and Andy were probably not travelling to that exotic island when Elizabeth photographed them in Southampton Airport on 5th October 2013. I have been asked for two submissions for the Christmas Exhibition, and have offered a choice of three on which my sister and I worked today. The small picture of Michael and his Teddy Bear originally used in my post of ‘Transitional Objects‘ was taken in July 1967. An A3+ print of a maple leaf carpet is from a photo taken at Exbury Gardens and featured on 12th November 2013. 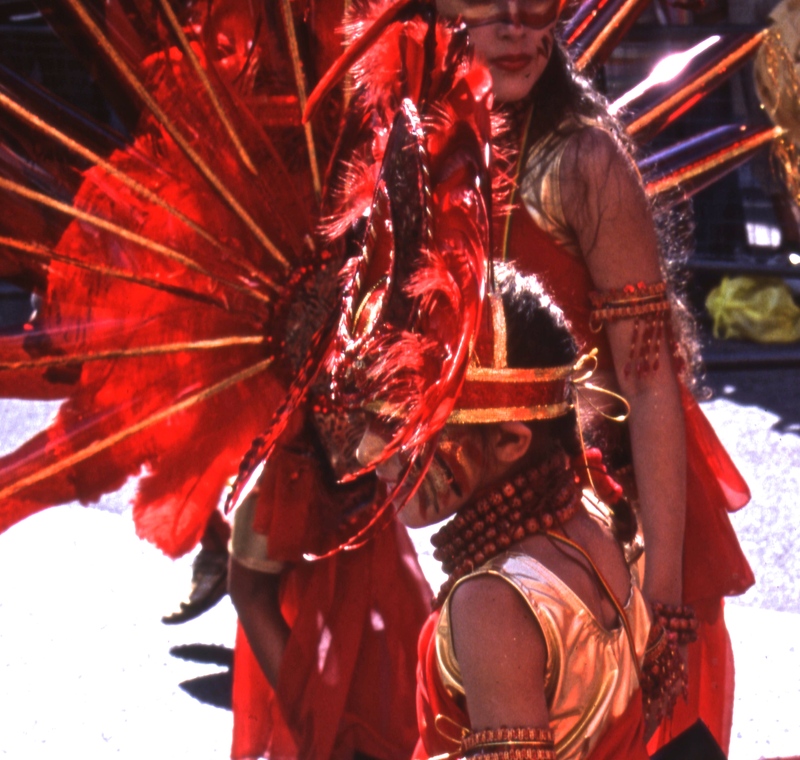 One I have not used before has been made from about one third of a colour slide taken at the Notting Hill Carnival in August 2007. Why I was very lucky to have taken this shot is described in ‘A Near Miss’. Late this afternoon, poor Elizabeth took herself off home with a box of photographs and the aromas of slow-cooked Jalfrezi teasing the nostrils which had no time to stay on to eat any of it. I, however, enjoyed the meal, especially as the accompanying savoury rice was topped with an omelette. Treacle tart was to follow. I drank some Las Primas Gran Familia 2013 tempranillo, and Jackie didn’t. I spent the morning grappling with BT once more. Everything worked fine early on, but I had been advised to change the temporary password. As they made the call it seemed reasonable to ask for the representative to help me do it. Then BT rang me and the rot set in. After more than an hour I was without access on my iMac. I was told they were not trained in Mac so I should contact my local technician. I pointed out that a colleague of my adviser had managed the process yesterday, but had used a different path. I was told they were not trained in Mac so I should contact my local technician. Apple Care is closed on Sundays. 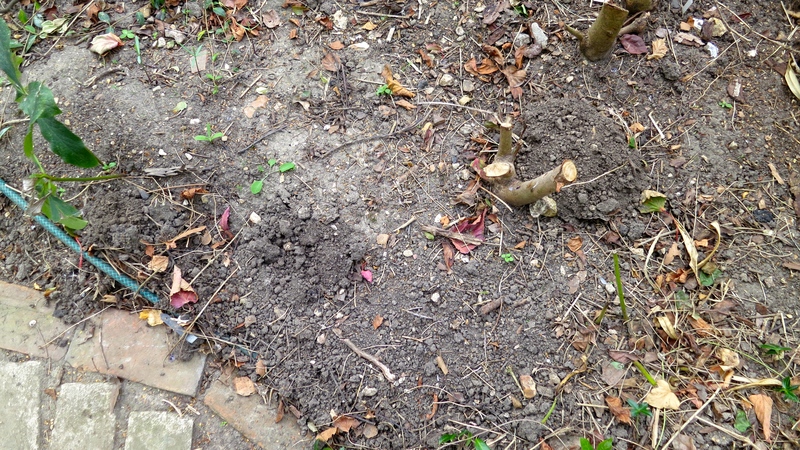 We have signs of mole activity in the garden. Before, on Barrie’s recommendation, making another trip to Woodgreen, Jackie hung her Wendy de Salis birds in their tree, the New Zealand hebe Koromiko. 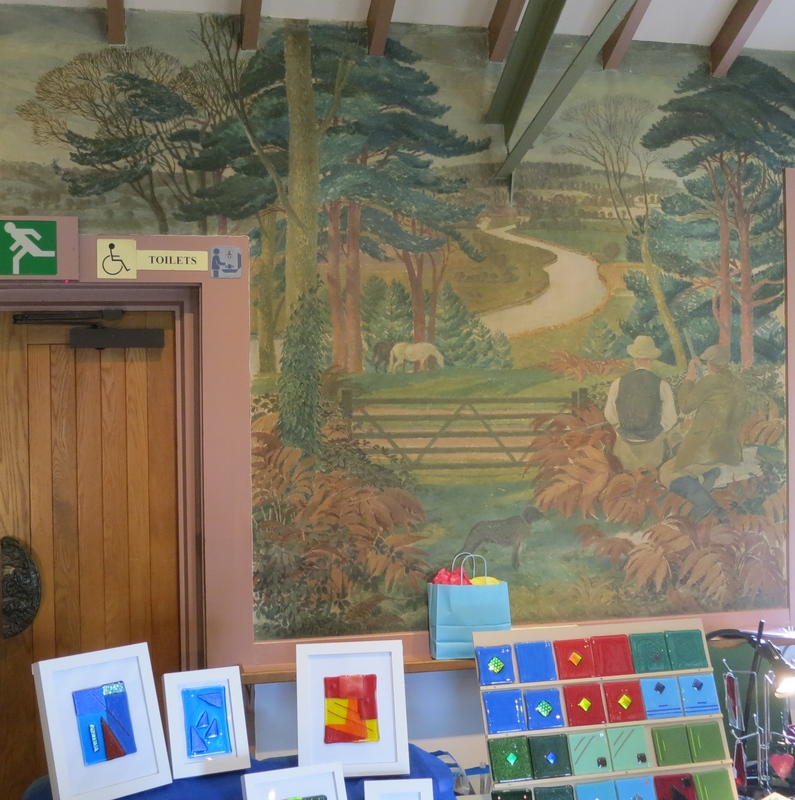 We had intended to visit the Crafts Fair in Woodgreen Village Hall on our last trip, but ran out of time. 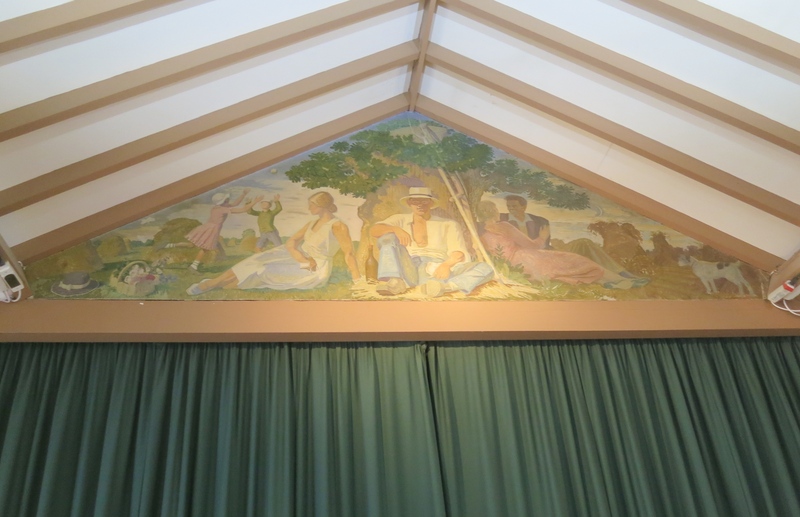 Barrie’s comments about the murals in that building made it a necessity to return. Elizabeth drove us there and back. You may need to zoom it to read it clearly. 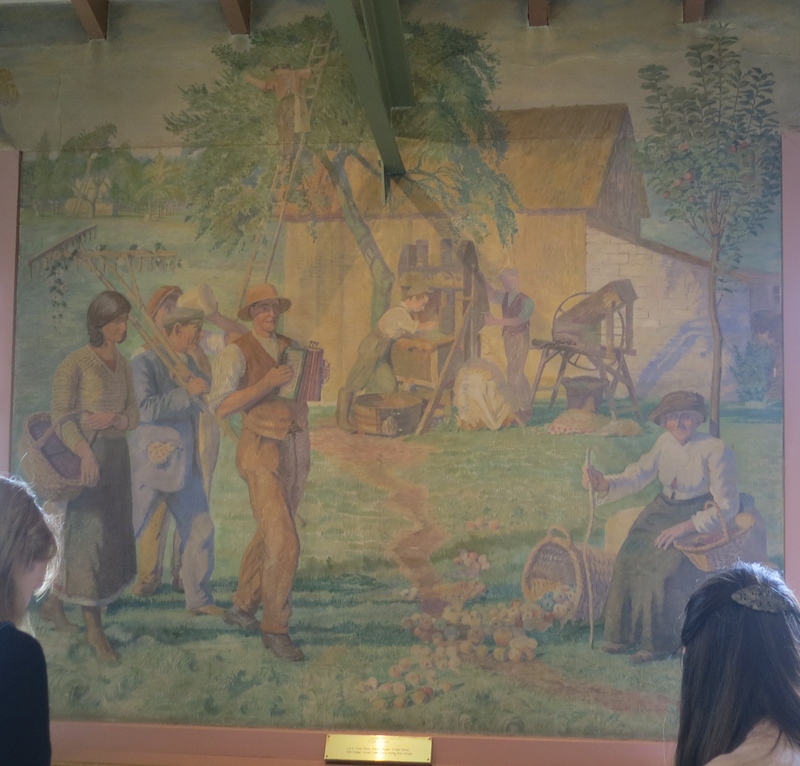 Where appropriate, I have included indications of today’s activity against the walls painted more than eighty years ago. 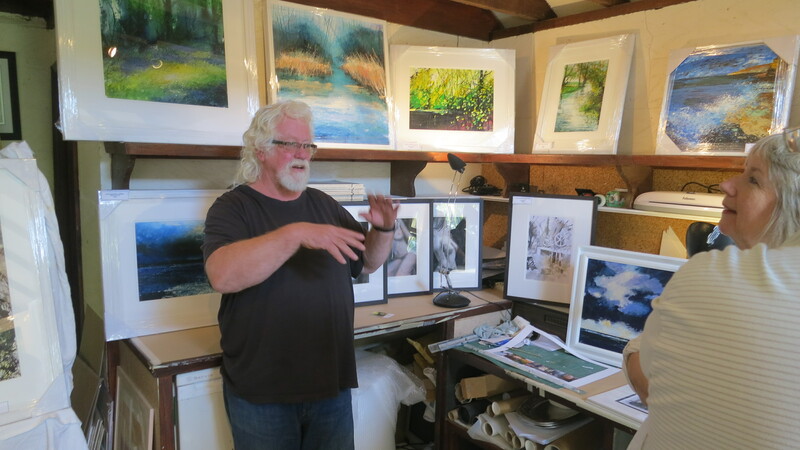 From here, we revisited Pete Gilbert’s studio, where Elizabeth popped in and bought a pastel painting. 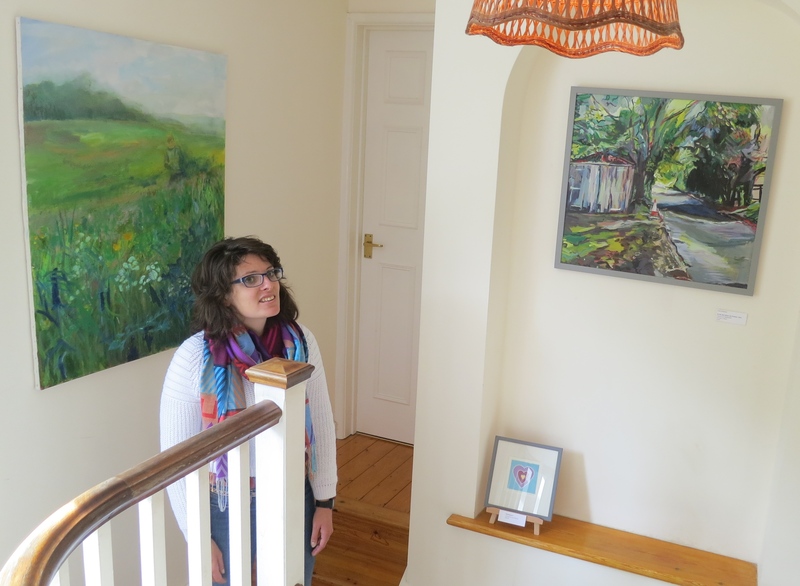 North of Breamore we visited Ways Cottage at Woodfalls, where work by Kate Buttimer, Lucy Barclay, Ed Cheesman, and Nikki Sheppard was on display. Elizabeth was fascinated by Ed’s sculptural spotlights constructed from camera parts. 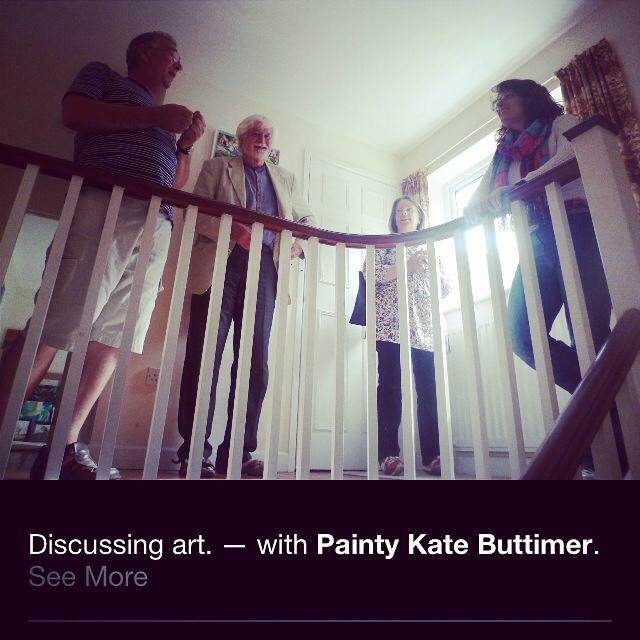 A photograph of our little discussion group, taken by Francesca Knitty Stout, has appeared on Kate’s Facebook page. 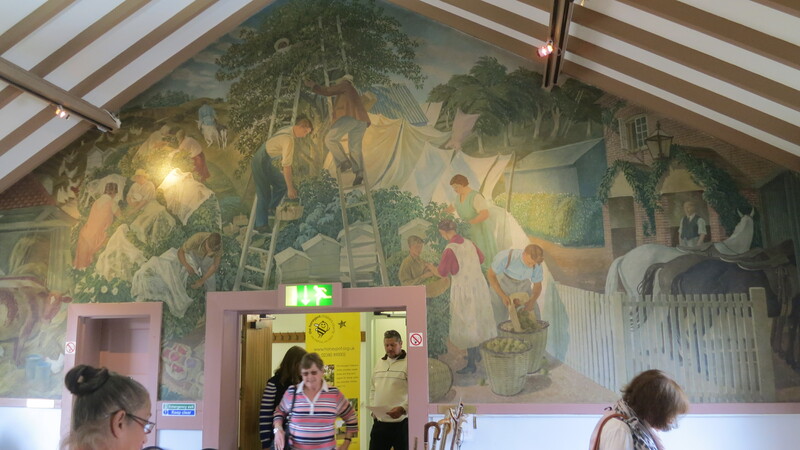 On our way home we stopped off at Waldrons at Brook where the work of 2002 Textile Artists was on display. I believe the number here must refer to the year, because there were only eight women exhibiting. Elizabeth bought four different sized small cloth purses with magnetic catches for Mum. They were just what she was looking for to contain notes and coins of different denominations for our nonagenarian parent who has failing eyesight and stiff fingers. Early this evening Elizabeth dragged me from my computer and urged me to photograph what she considered to be one of Jackie’s works of art. 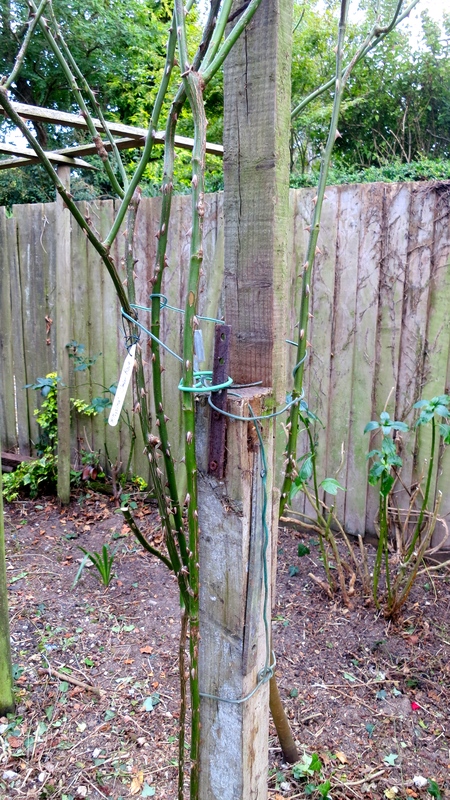 The two women had almost completely cleared one side of the kitchen garden, leaving an ‘Altissimo’ climbing rose requiring a new supporting post. 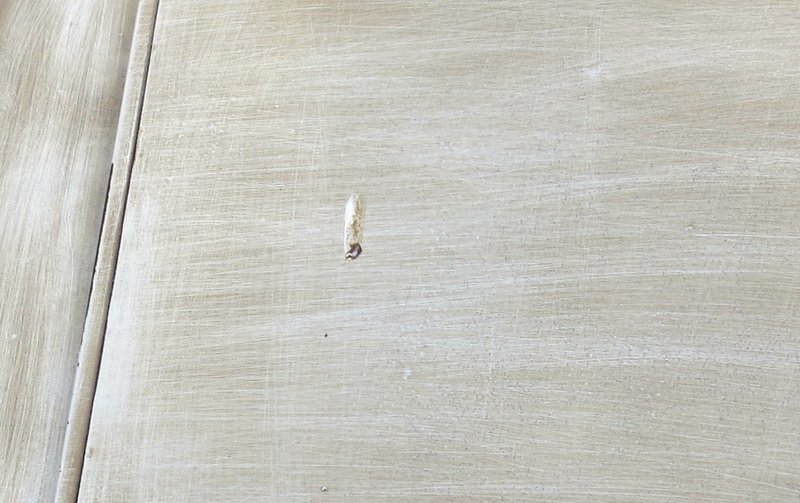 She found a suitably typical piece formed from two previously cobbled together different beams, and discovered that they fitted the metal holder whose previous occupant had rotted away. This evening’s dinner was focussed on yesterday’s pork paprika, well matured and served with superbly crispy roast potatoes and toothsome runner beans. Bread and butter pudding with evap was to follow. Elizabeth and I finished the last two opened bottles of red and Jackie the white wine. Some time ago, my friend Harri sent me a photograph of an owlet in her garden. 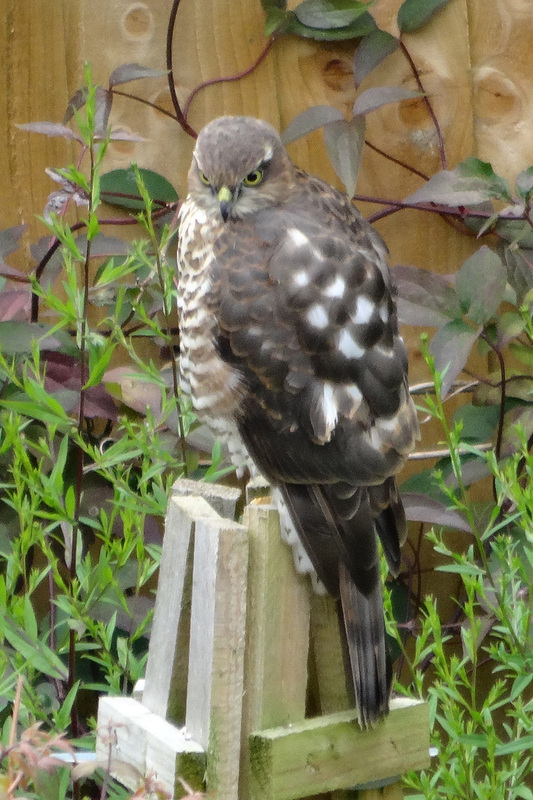 Yesterday, Chris sent me two shots of a sparrow hawk seen in his. 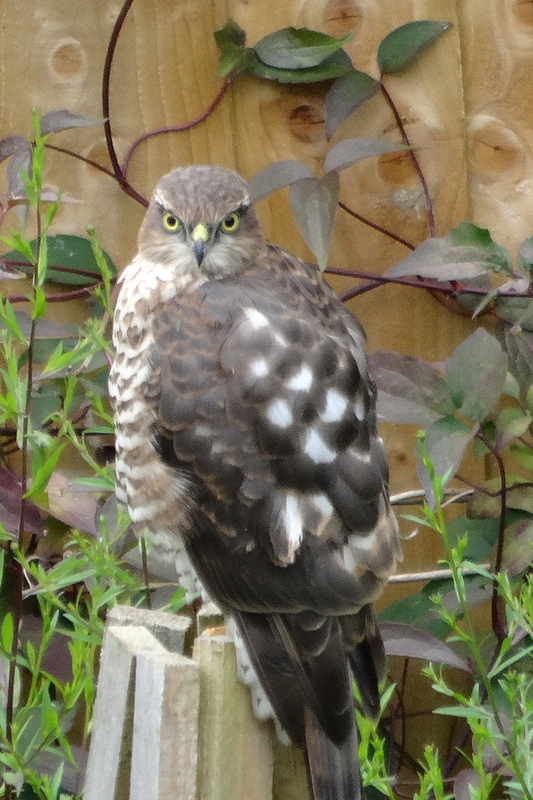 I seem to be collecting donated photographs of birds of prey, better than any I could have taken myself. Jackie’s sister Helen has a collection of models of owls which has developed in a similar manner. I do hope reading this doesn’t prompt her to send a photograph of one, otherwise I will have to put it in a post. This reminds me of Mary, an old friend who had a vast number of frogs made of all kinds of material. Her apparent love of these amphibians was apocryphal. It had begun with one gift. Someone else had seen that and donated another. The present-giving snowballed, and the creatures took over her flat. Fortunately my brother’s missive arrived before I was rash enough to telephone BT to sort out an e-mail access problem. I am so frustrated by the lack of service that I cannot be bothered to give you the usual detailed saga. Suffice it to say that two advisers, and virtually a whole morning later the reception is no better, and that it was only the second one who thought to tell me that the problem was widespread and maintenance was being carried out. Later Jackie, Elizabeth, and I began another blitz on the kitchen garden. 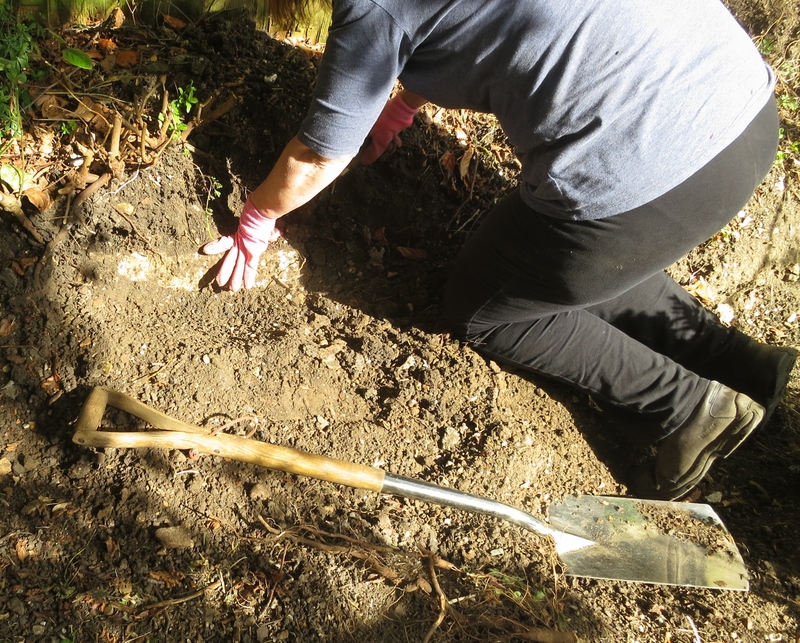 Although there was a sharing of tasks when necessary, I was assigned to digging up concrete and stone, whilst the ladies cleared weeds and shrubbery. I was required to extract two rather more mature shrubs. 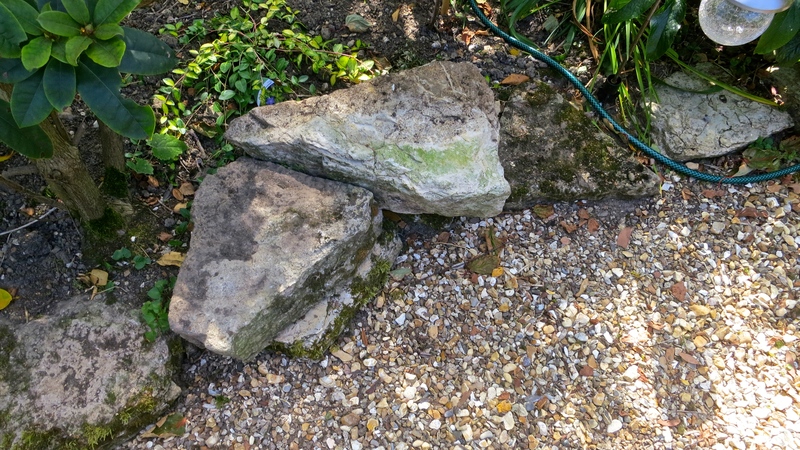 One piece of natural stone I could not lift was ideal, Jackie thought, for the path-edging she has been working on. This meant it had to be moved. 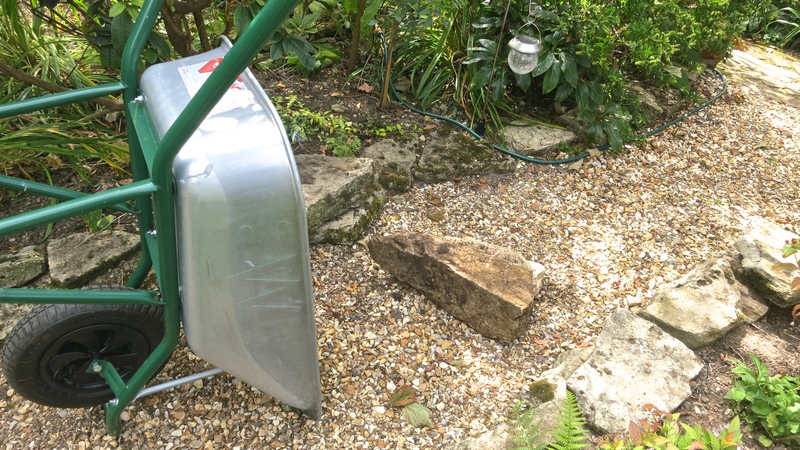 We upended a wheelbarrow, prised the rock into it, transported it to the relevant site, tipped it out, and wobbled it into place. It has gradually become apparent that, in many places, the removal of one layer of material from the site is not enough. 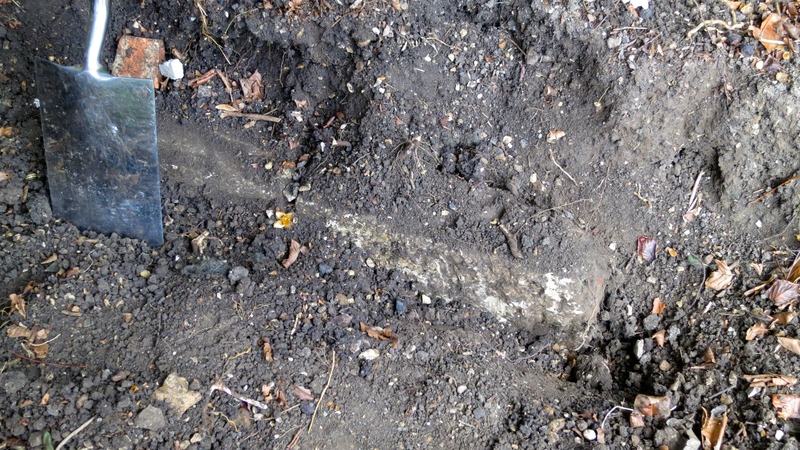 Beneath a thin layer of soil more concrete will be found. 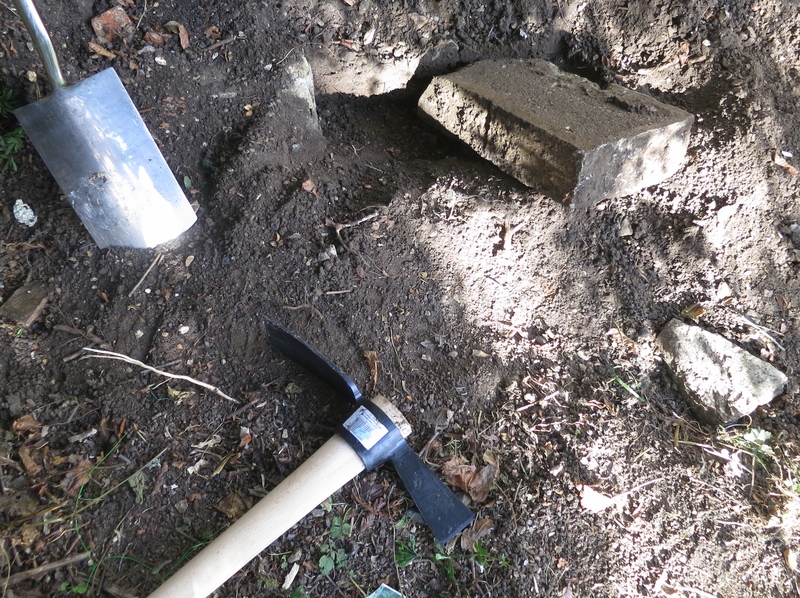 A little Time Team type excavation is necessary in the search for such blocks. As I was unable to access the service of one of the family Jack Russells, Scooby or the late Oddie, Elizabeth stepped into the role, knelt down and scraped away at one particularly stubborn slab that turned out to be one of the biggest, turned on its side. Even after she had exposed it, I could not shift it with fork and spade. She therefore drove me off to Milford Supplies where we bought a grubber axe which eventually did the trick. 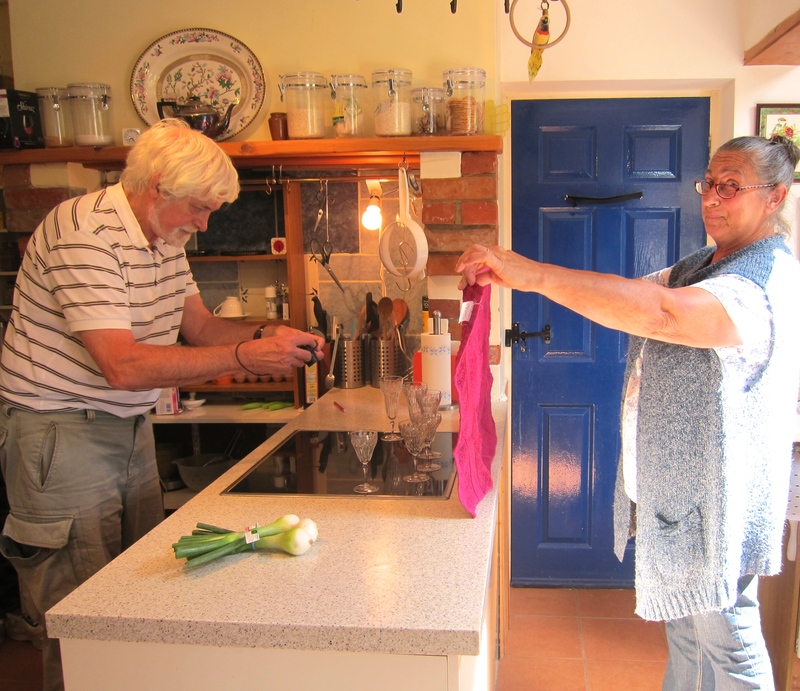 As often between stints in the garden, Jackie cooked our dinner. 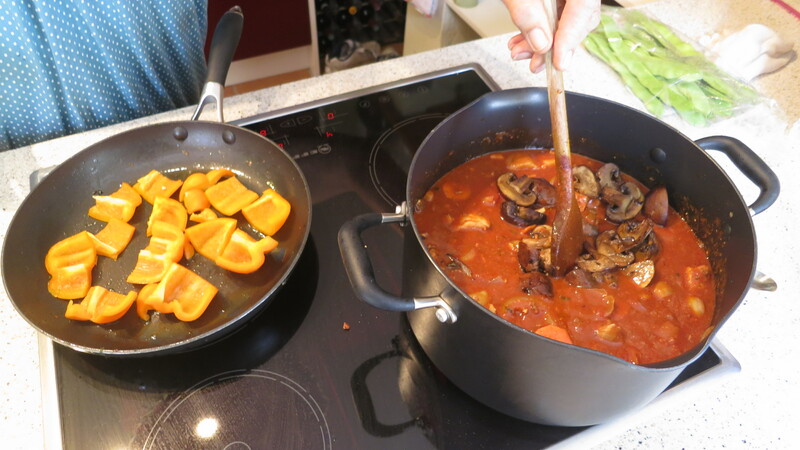 Tonight’s was a piquant pork paprika, served with savoury rice. Needless to say, it was delicious. Tiramisu was a suitable dessert. Elizabeth and I drank Blason de Bourgogne 2012, and Jackie continued with the white Cuvee St Jaine. 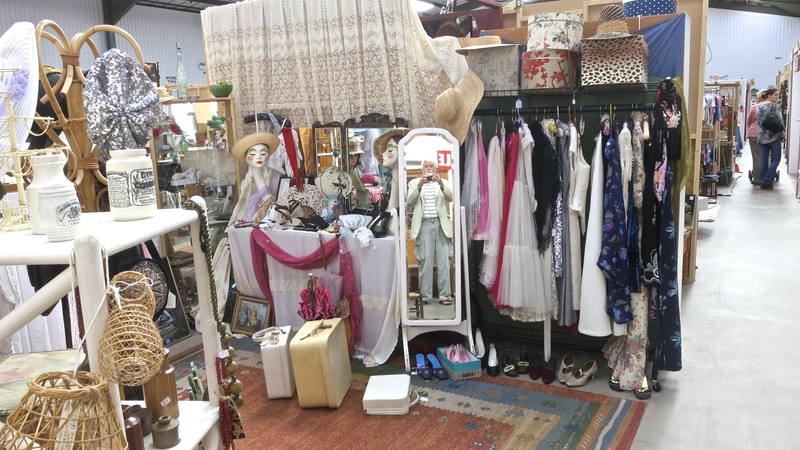 Molly’s Den is the name of a company that runs vast Vintage Antiques emporia in Hampshire and Dorset. We chose to visit the one in New Milton this morning. It offers several hours entertainment and the opportunity to pick up interesting bargains. 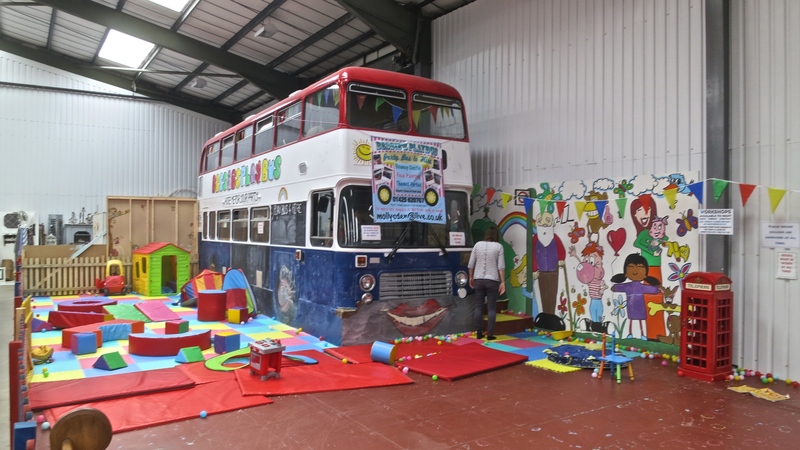 There is a tea room, a very large play area, including an old bus, for children to amuse themselves for hours. 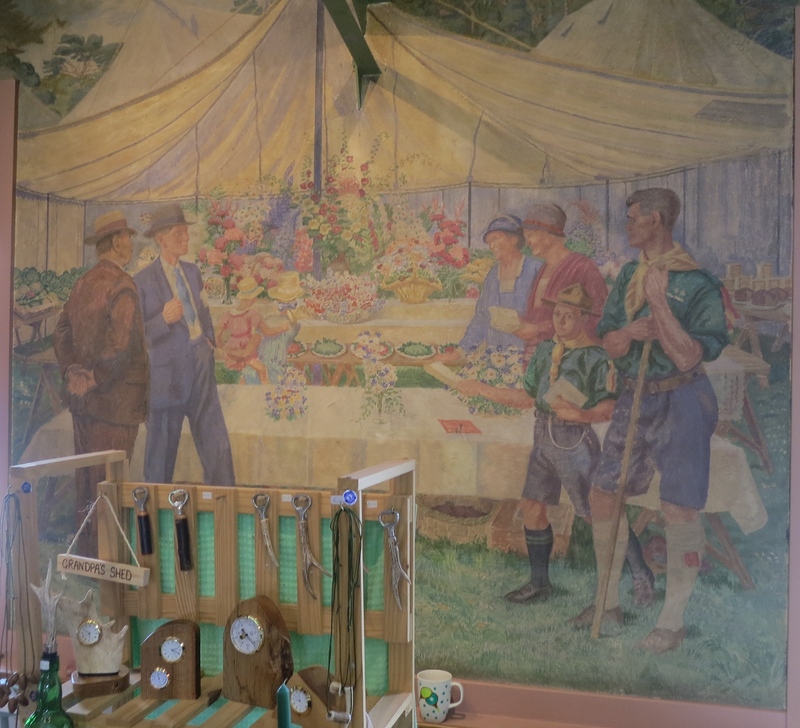 The refreshments and the children’s facility provide welcome respite from wandering up and down the aisles examining the fascinating wares on display in units varying in size from a cabinet to a twelve foot square room-sized cubicle. Elizabeth pointed out a ‘monstrosity‘, the family term for which is explained in my post of that title. 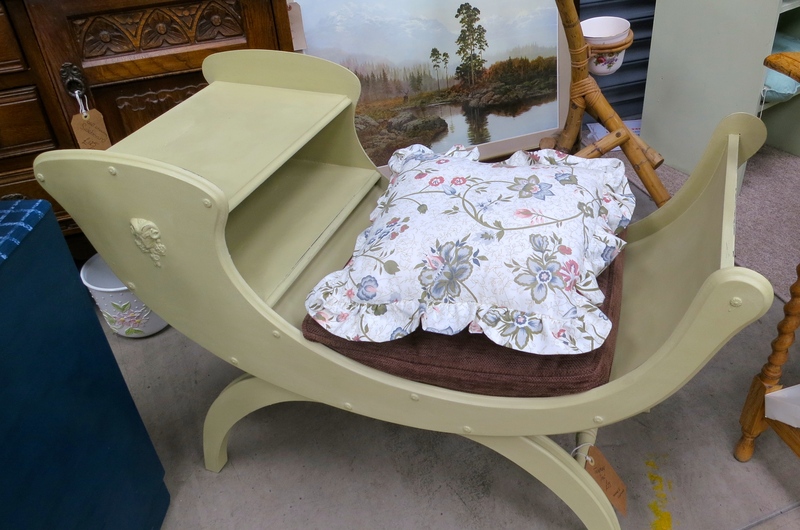 In fact the Molly’s Den one is far more tasteful than the telephone table described in that story. An unexpected embellishment to a desk caused me to look up to the ceiling in search of an open skylight. There wasn’t one. 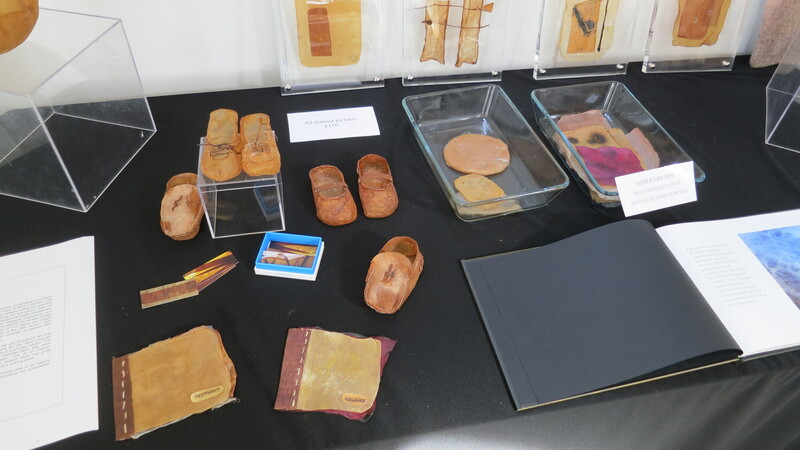 As always, exploring outlets for items which for some are history and for me reminiscent of my own lifetime, I was taken back to childhood by some exhibits. 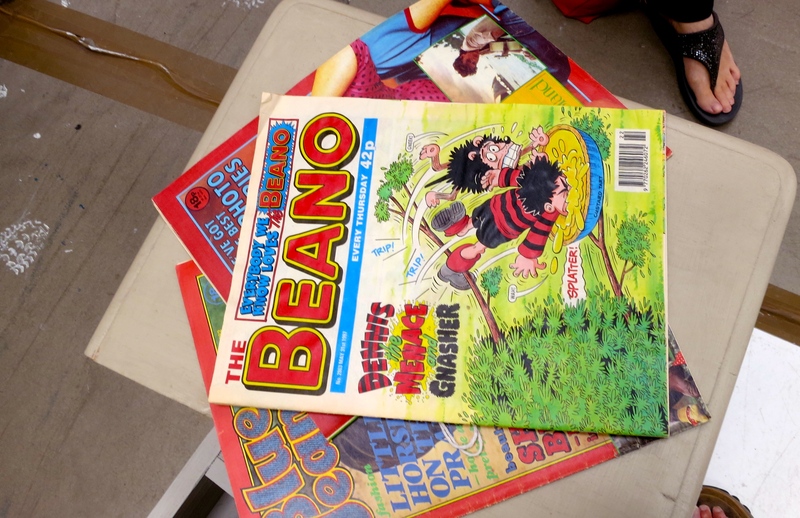 The several copies of the Dandy and Beano on offer dated mostly from the 1990s. We enjoyed them at home in the 1940s and ’50s, but we had to wait for Mum to read them first. In my photograph can be seen two painter’s footprints and Elizabeth and my sandalled toes. That seemed quite a happy coincidence. 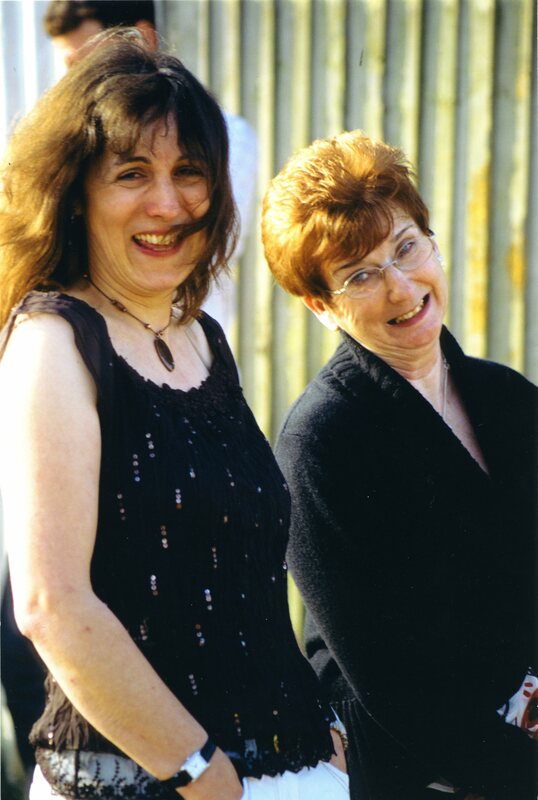 I have already featured the practical use Mum made of dressmaking patterns. 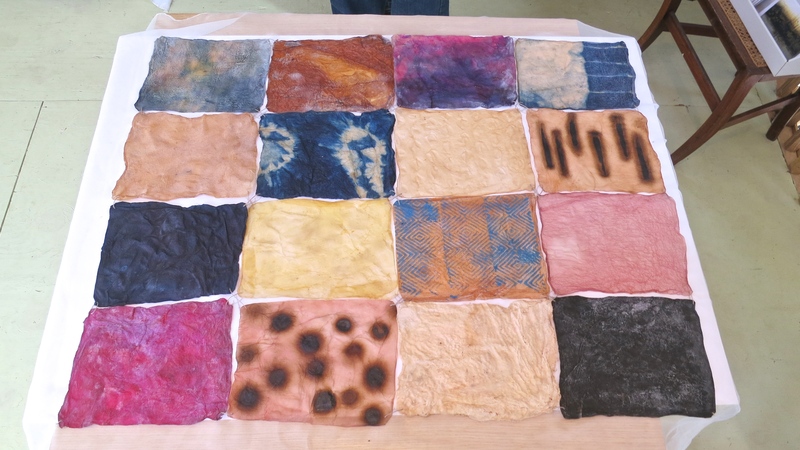 Today I noticed a rack of possible covers which were guaranteed to be contemporary with the tissue paper we sat and contemplated in our early years. There was plenty of opportunity for Elizabeth and me to appear in a reflective mood. I even managed a selfie. 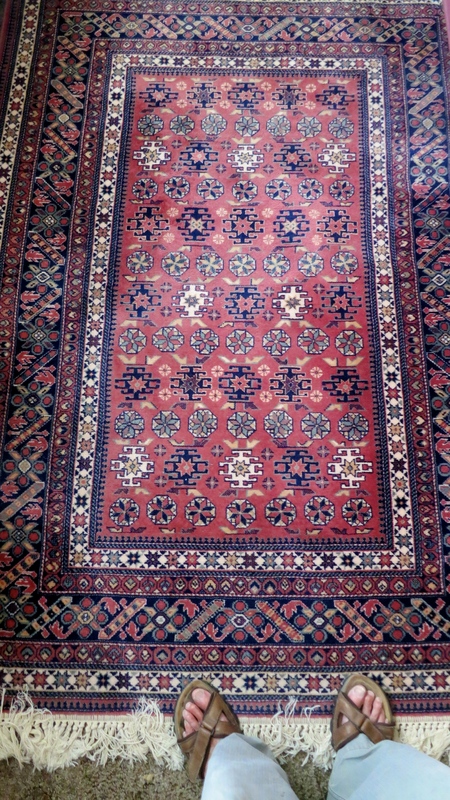 I bought an apparently unused 6 foot by 4 foot pure wool rug with hand-knotted fringes for the incredible price of £18. 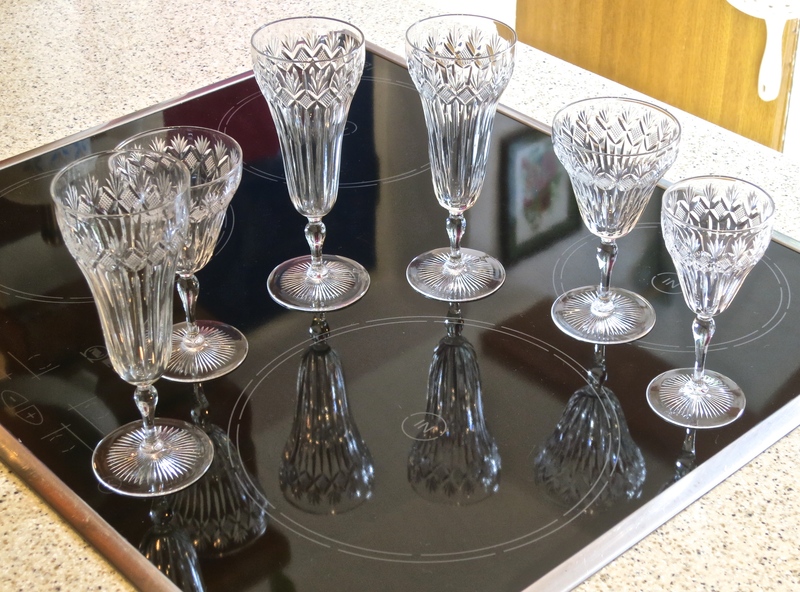 Jackie capped it with nine Victorian etched glasses for half that price. For some reason Jackie and Elizabeth were amused at my efforts at photographing the glasses. 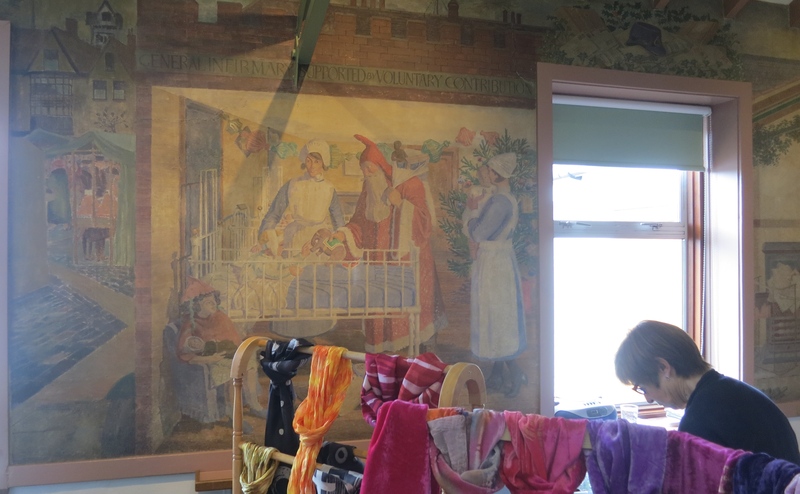 I was oblivious of this as I concentrated on the subjects and got my lady to hold up a towel in an effort to reduce glare from the window. That particular device was soon abandoned because it produced a coloration that suggested that the receptacles already contained wine. Reminiscing about our respective childhoods over lunch led to discussion of those rare trips to the seaside. Jackie’s grandfather, a motor factor, always had a car; but when Elizabeth was very small our Dad didn’t, and we relied on those of uncles. I have entirely forgotten one of our outings, but my younger sister has not. She was too young to remember the venue, but the story, from about 1959, has stood the test of time. Apparently Dad, Chris and I had sneaked a small suitcase onto the beach, unbeknown to our little sister. When we got home she was presented with the container. When she opened it, there before her very eyes was a heap of sand and shells enclosed in a secure space. She had her very own ‘seaside’ with which to play in her London garden. Elizabeth bought a print of one of Pete’s pieces, more of which are seen behind him in my photograph. She then dashed back for a chopping board. 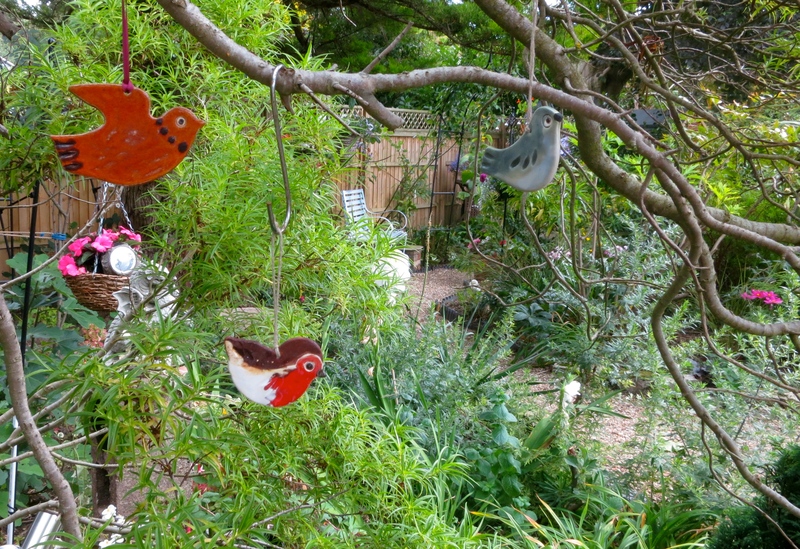 We bought three of Wendy de Salis’s ceramic birds to hang in our trees. 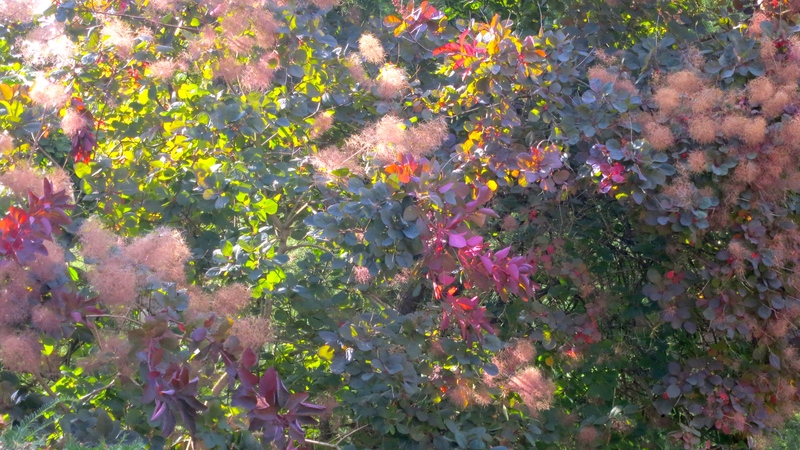 The sun, playing in the smokebush tree in Wendy’s garden, seemed to know it was part of the group of artists. Hordle Chinese Take Away provided their usual splendid meal for our dinner. Elizabeth and I drank more of the Cuvee St Jaine. Drank open, and enjoyed, the dry white version.